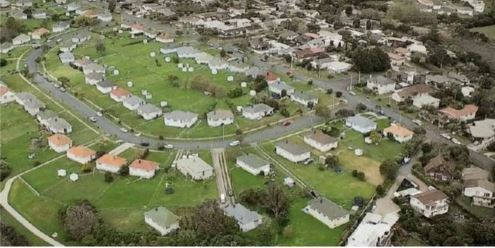 Ngati Whatua is poised to announce a huge redevelopment of part of its North Shore land holdings, capable of taking hundreds of new residences. Its plans for five streets of housing in the Belmont/Bayswater/Hauraki areas between Takapuna and Devonport are yet to emerge. But indications are the iwi is planning a major intensification, perhaps in conjunction with a private developer. At Wakakura, the ex-navy land it bought in Ngataringa Rd, the iwi has already signed a lease to retirement village owner and operator Ryman Healthcare. The iwi refers to its 21.3ha as the Hillary Block, named after the single biggest holding: 7.26ha on Hillary Cres, Belmont. A double-page full colour aerial photograph appears in the latest annual report for the year to June 30, 2015, showing some of the Belmont/Bayswater/Hauraki land, now occupied by dozens of weatherboard or brick navy houses, most stand-alone but including some duplex units. Click on image to enlarge. The properties are leased mainly to the navy until 2018 when the iwi can progress. In its unitary plan submission, Ngati Whatua emphasised the land’s advantages and indicated that it would dismiss all objections based on its plans putting pressure on existing roads, schools, parks, retail and other infrastructure. “The subject sites are generally large and compact in size, located in close proximity to public transport routes and community amenities and typically have good outlook, amenity and views. In particular, the majority of sites have stellar views towards the Waitemata Harbour, Hauraki Gulf and the CBD or Waitakere Ranges,” it said. “The area is well serviced by community amenities such as schools, local shops, parks, sports facilities and public walkways,” it said, adding that its land was within 400m of public transport. It sought to build higher, up to five storeys on some plots, and asked that pre-1944 demolition controls be removed. It also wanted the single housing zone on Marsden St houses replaced with mixed housing zone, allowing more intensification there. Holdings declared state the iwi owns 7.14ha on Plymouth Cres, nearly a hectare on Beresford St, 7.26ha on Hillary Cres, 1.86ha on Birchfield Rd and 4.08ha on Marsden St.
Auckland councillor Chris Darby welcomed plans for the land. well if people didn’t know before hand they sure do now. this was always on the cards..just means that getting into and out of Devonport is now going to be a lot harder and take a helluve a lot longer..nice photo of Plymouth cres..and as for them saying that transport is covered with the new sites close to bus txport etc etc, doesn’t mean diddly squat, still going to increase cars etc in the Devonport area.. just look at what has happened south of manukau. try getting to manukau in the morning in a hurry..and Devonport at the moment is just bloody horrible to get into in the mornings..oh and out of..
One of those units from Wakakura Crescent should be an exhibit at the Pussers Musuem. A lot of history/memories passed through their doors. Unfortunately, I never had the privilege of living there! Nice to know that something “positive” is being done. As with many of you guys Plymouth Cres & the other pussers housing areas hold fond memories of where our families grew up and the neighbourly friendship we enjoyed over the years. Kia kaha!